We mourn the passing of Elizabeth Edwards, a great woman and a gifted writer who inspired all of us with her courage, resilience, uncompromising intelligence and compassion for others. 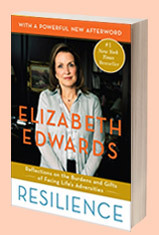 Elizabeth Edwards was a graduate of the University of North Carolina School of Law. She worked in the North Carolina Attorney General's office and at the law firm Merriman, Nichols, and Crampton in Raleigh. She also taught legal writing as an adjunct instructor at the law school of North Carolina University. Also available as an abridged audiobook download, unabridged audiobook download and an eBook.